Your kitchen faucet is what you most likely use to clean your dishes, fill cups with drinking water and use for water when cooking or cleaning. How many times have you thought to look at the underside of your kitchen faucet though? Is it a spot that you remember to clean often? If not, it definitely should be. Kitchen faucets are a breeding ground for mold, mildew and lime buildup, and should be cleaned at least once every couple of weeks. 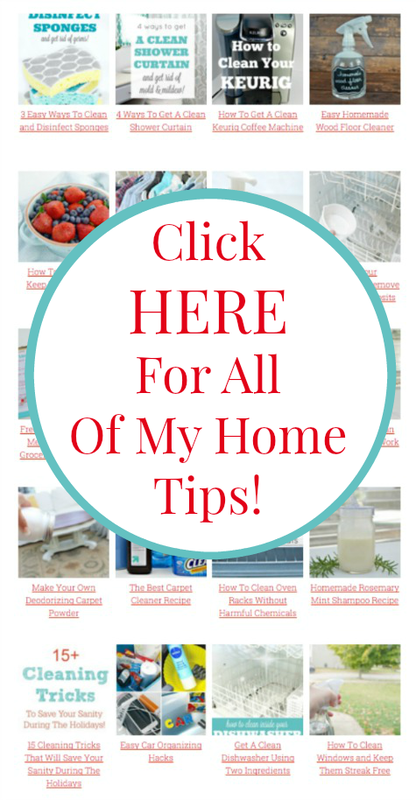 I’m going to show you a super easy way to clean a kitchen faucet so you can feel good about the water you are using on a daily basis. 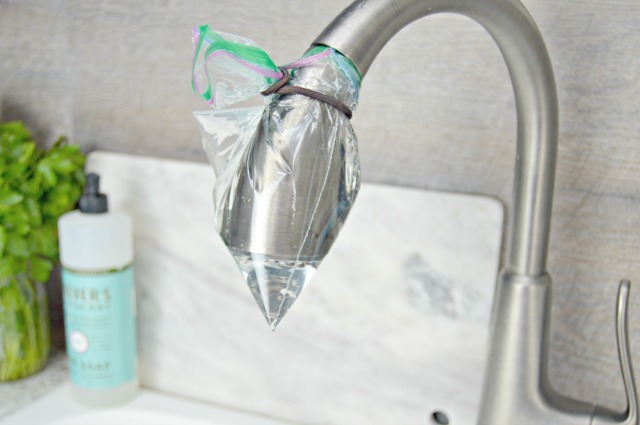 To clean your kitchen faucet, all you need is distilled white vinegar, a baggie and a rubber band or elastic hair tie. Start by filling your baggie half way full with distilled white vinegar. Any white vinegar will do. 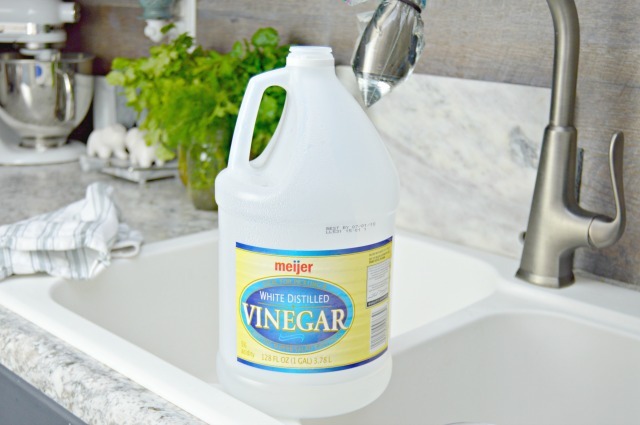 Vinegar is an amazing disinfectant and will help kill any germs and bacteria. 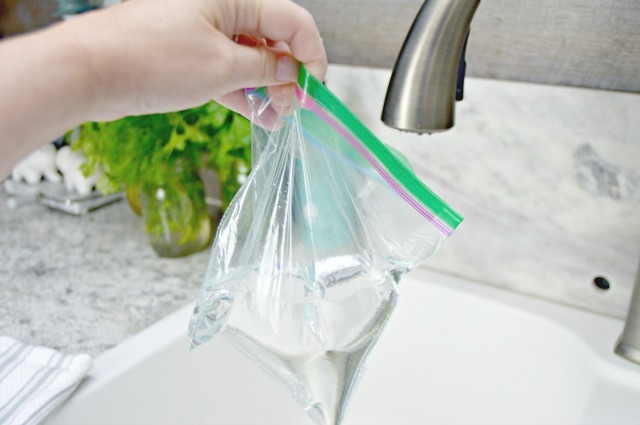 Pull the baggie of vinegar up over your kitchen faucet and secure it with your rubber band or hair tie and let sit for 20-30 minutes. Remove the baggie and discard. 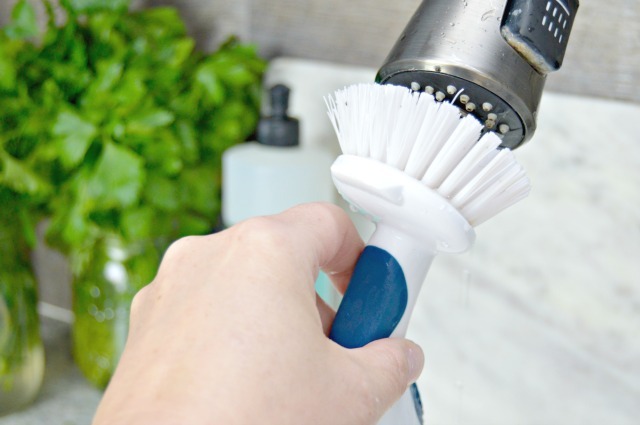 Use a dish brush to remove any bits that are left on the faucet head and rinse with warm water. 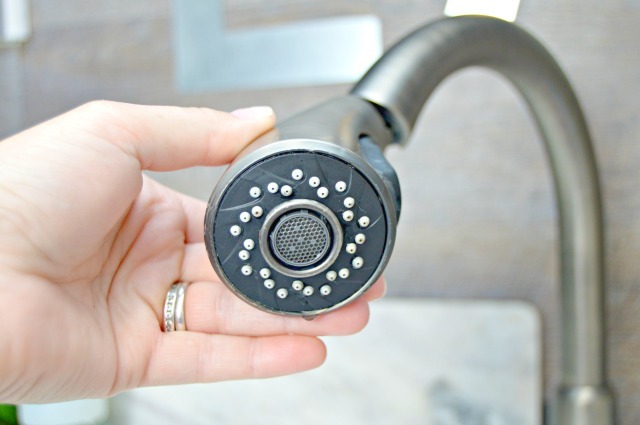 All of your faucet’s jets should now be clear of any mold, mildew, lime build up and food particles, so you can use it without fear of spreading those things to other areas of your kitchen! Vinegar is my best cleaning friend! I have multiple allergies to chemicals used in “normal” cleaning items so I love to see more people using it and sharing ideas of ways to use it. Like many, I went “Yuck!” at the thought that I haven’t cleaned my faucets in a long while! On my list to do this week end! Tried kitchen faucet trick on hand held and regular shower head in bathroom. I worked great. Still some trouble with hand held. It dribbles. Way better than before. Thanks. I have just remodeled my kitchen and installed bronzed faucets. Will vinegar harm the finish? Do not want to ruin a beautiful kitchen. Thanks. How often do you recommend doing this? Once a month? Once a quarter? Hi love your tips, etc on here…have a couple of questions if you could please answer them,,,,,or do you do a bunch a certain day or do you do private email msgs. to people who email you ? I love your oil spray idea…..I use a lot of that and it is quite expensive….my question is how do you clean the sprayers ? I bought one from a good company and after awhile, I tried to clean it and the oil just would not come off, I think I ended up throwing it away…. I hate the spray cans of the oil, I would rather spritz mine on….. but mixing water with oil, it really works ? My next question is, spiders…..how is the world do you get rid of spiders beside spraying with this stinking spray..? And does it kill them? I don’t want to run them out of one place and they go to another place, I want to get rid of them permanently….Someone said use PEPPERMINT ESSENTIAL OILS and they will leave…..but I want to eliminate them, not run them from one room to another…. do you have an answer for this one ?